Have a passion for interior design and plants, books and music, DIY and creative projects, arts and travelling. For some while I have been following a Finnish crochet artist Molla Mills. 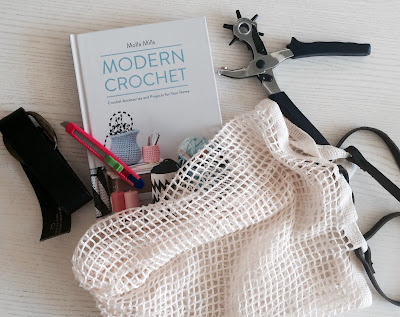 She is not only a gorgeous girl, but also has amazing crochet ideas and products. Following her recipe from her book "Modern crochet" I crocheted this nice net bag. For the handles I used an old belt, which was cut and sewn. 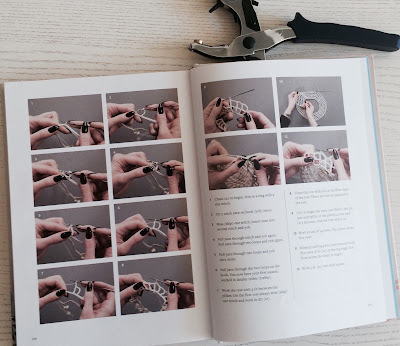 The book has many other cool home and personal accessories, which are explained in an easy way and have detailed pictures, so even the beginners, like myself, can produce some cool things. PS: You can buy the book on the Amazon. Recently I discovered a genius way of recycling - lovely body scrub made of used coffee grounds! Besides dried coffee grounds there are only two other ingredients: sugar and oil. The scrub with coffee gives extra stimulation to your skin not to mention the smell! Mix all the ingredients and put in a jar. Enjoy! Recently I discovered the benefits of eye pillows, which has relaxing effects (I didn't even know that pillows for eyes existed!). These are used to relax after yoga, or just to fall asleep. I am really happy for mine with lavender fill (for extra relaxation). It is a very easy DIY project, which doesn't require too many ingredients or skills. 1. Sew a small rectangular pillowcase (the size is up to you), leave a little opening for the filling. 2. Mix approximately equal amount of linseed and lavender flowers and fill in the pillowcase. I rolled a paper tube to make it easier to put the mix in the pillow. 3. 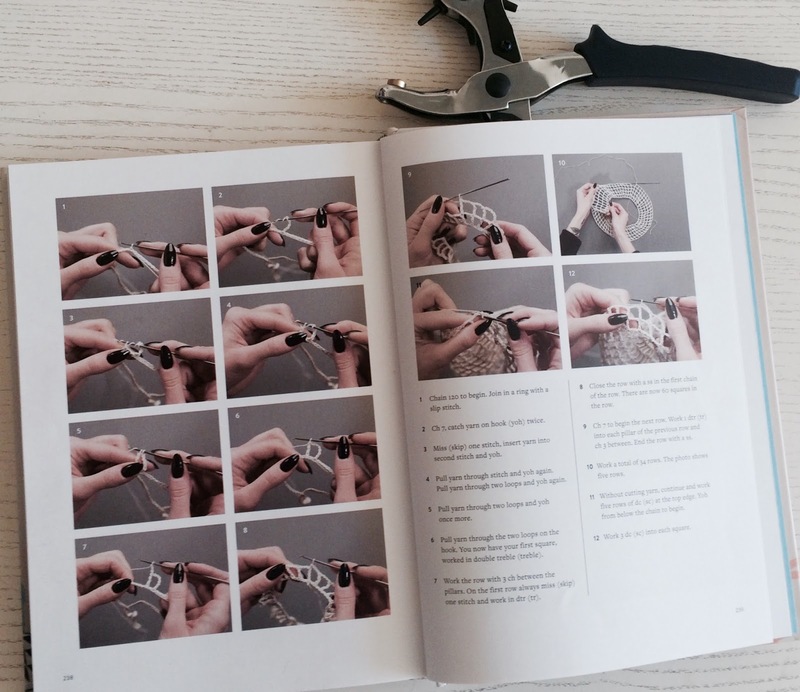 Sew the opening and voila! I would suggest to make a separate removable pillowcase, so that you can change them and keep them clean. The summer is almost over and it is soon time for cozy warm pullovers! 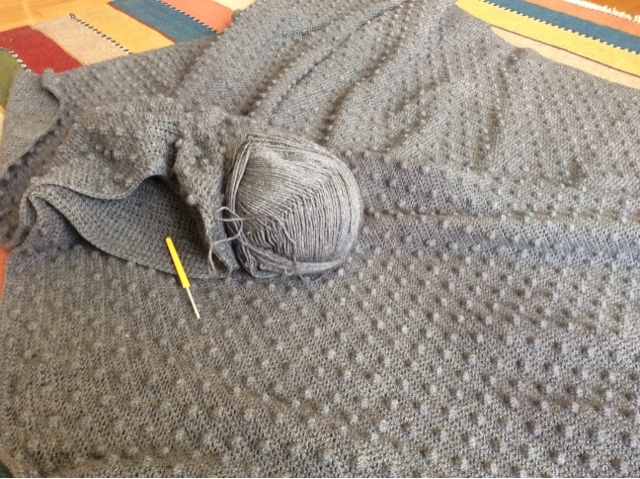 After crocheting a huge blanket with bubble stitches and with some leftover yarn, I decided to get into another project, this time a pullover (in total match with my blanket! Wonder if anyone would find me under the blanket wearing the pullover). The project is still in the process, but it is almost there! 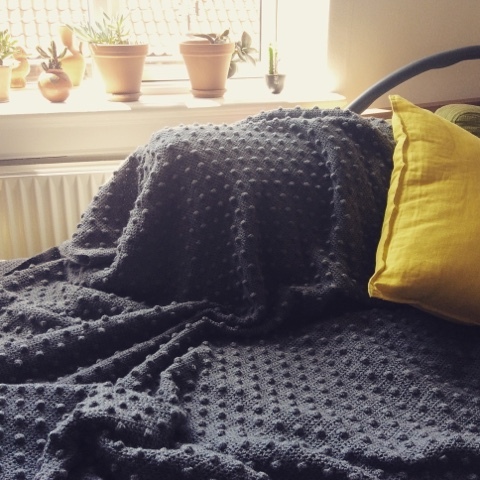 After some months with on and off crocheting I finally managed to finish this blanket and damn satisfied with the result! Today my day started with this superhealthy breakfast, which is so fresh and tasty! 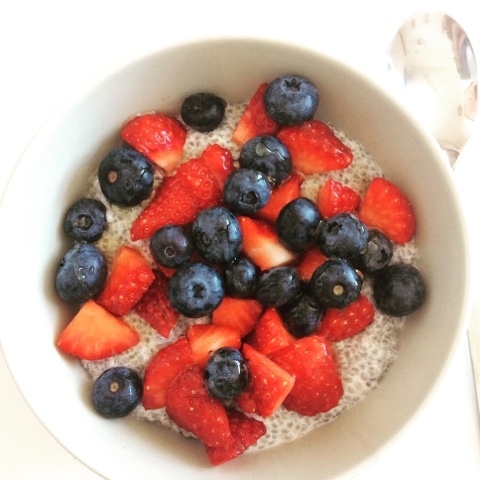 Not to mention the health benefits of chia seeds and berries! It has only few ingredients and easy to make. Mix almond milk with chia seeds and vanilla sugar. Let it stay in the fridge overnight. In the morning mix well and add a bit more almond milk if needed. Put the berries on top and viola! If you want it sweeter, add a little bit of honey. 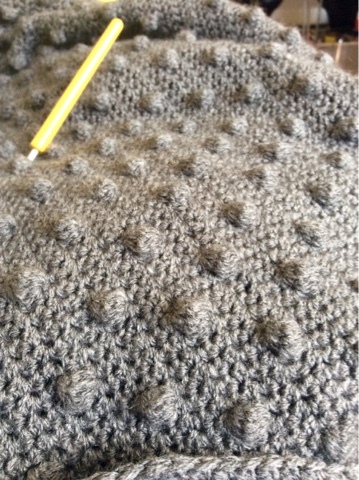 Working on a large crochet blanket with bubble stitches. Takes time and lots of money for yarn, but I know it will pay of! The bubble stitch looks complicated but quite easy really. I learned it from this video tutorial. meandmyrumba. Simple theme. Theme images by kim258. Powered by Blogger.